I was waiting for my daughter at middle school when the call came in. "Mike, I'm headed over to Guitar Center to listen to studio monitors for my production suite. Wanna come with?" I enjoy playing with all kinds of gear, but speakers are perhaps my favorite, mainly because the differences are so profound. The caller was Erik; our lead audio volunteer at Upper Room and CPC's new technical director. Erik and I are both hard-core geeks, so I knew we would have fun. I'm not normally that thrilled about hanging out at Guitar Center, but they did have a decent setup for listening to studio monitors. They had a couple of racks full of speakers, a small Rolls mixer and a selector switch. Given that we were surrounded by about $100,000 worth of other studio gear, I was a bit disappointed in the Rolls, but what are you going to do. After rounding up to GC employees to get an iPod cable hooked up, we commenced listening. Erik brought some very high bit rate files, and I had my own collection. Disclaimer here: This was not designed to be a test to determine absolute pristine quality. We're not planning producing hit records with these. We were looking for monitors that were reasonably accurate, and had pleasing tone. That's why we didn't worry about not running them through a Manley tube pre. And the reality is, we're normally working with compressed audio sources in our work anyway, so playing Apple lossless files was perfectly acceptable, as were the 256kps AAC's. So no flame posts about how we weren't using high quality sources, OK? Here's what we heard. GC actually had a decent selection; and we were there mainly to audition the Yamaha HS80M. Someone had recommended those to Erik, and they were priced well. But, how did they sound compared to speakers costing 2 and 3 times as much? Actually, pretty dang good. 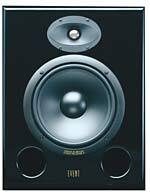 In fact, I would contend that they sounded almost as good as the most expensive monitor on that rack, the JBL LSR4328P. But before we got the serious listening, we had some work to do. After the GC guys left us alone, we started calibrating monitors for comparable volumes (louder speakers tend to sound "better"), and proper EQ and boundary settings. It's always amazing to me that retail outlets generally do such a poor job at this. We even found one speaker unplugged, and another not turned on. Kind of destroys the stereo sound field when you only have one side (or one is set 8 dB lower than the other). GC, your speakers are properly set up now. For those with short attention spans, my favorites were the HS80Ms, the Event ASP8 and the aforementioned JBL. Oddly, that's in descending order of favorites and ascending order of price. Actually, I may have liked the ASP8s better, but they were almost 3x the price of the Yamaha's, so it's hard to justify. I found the Yamaha's to have a expansive sound field, very smooth vocal and mid-range response, highly detailed high end, and decent bass. If you're mixing hip hop they may not cut it, but for everyone else, they should be sufficient. Listening to some Norah Jones, the brushes on the cymbals were plainly heard with pleasing detail and all the smoothness of her voice came through. The even revealed the hint of raspiness she sometimes brings out. The stereo sound field seemed as wide as the room itself, and the overall sound was expansive. A non-ported box, the bass was very tight and fast. One could clearly hear the subtleties of the string bass and the muffled thump of the kick. Overall, a great sound, and a great value. I've had Yamaha speakers in my home theater for 12 years now, and am always amazed at how clean they are, and how little I paid for them. The ASP8s were very similar, with perhaps a tich more high end detail. They also had more low end oomph--they're a ported enclosure--but the bass didn't seem quite as tight and detailed as the HS80Ms. As with the Yamahas, the brushes on the cymbals came through very clear, and the vocals were pure. I've been a fan of Event since a buddy of mine gave me some PS8's to demo some years ago. I actually had to buy them because I wouldn't give them up when he came to pick them up. We also listened to the Adam A7. Those little beauties with their ribbon driver had perhaps the smoothest midrange response of anything we listened to. Norah Jones appeared to be singing right in front of us, with all the detail and grain of her voice perfectly reproduced. On the negative side, the high end was lacking in subtle detail and extension. And the string bass was barely audible. I supposed paired with a sub, that would have been corrected. I could have listened to these all day, however. Other interesting findings were with two models from KRK. Though we weren't really interested in these, I was curious to hear them, as I've heard a lot about them, but never actually listened to them. We spent a lot of time with the VXT8, mainly because they had no bass response at all. Worse than the A7 in fact. And the VXT8 has an 8" woofer to the A7's 6.5." We played with EQ settings, gain, moved them around and nothing. In fact, the VXT6 had better bass extension than the 8's. I know...weird. We honestly wonder if there was a problem with the demo models, because they just didn't seem right. Actually, the VXT6s sounded pretty good. The stereo field wasn't nearly as wide as the front runners, but the detail was pretty good, the mids sounded clean, and bass wasn't bad. But at nearly 2x the price of the HS80M, they were out of the running. Then there were the Mackies. We started with the HRT824s because they were #1 on the switch. At first blush, they were OK. If that was all we had to listen to, we might have lived with them. But when we switched to the next set (which I'm blanking on, but it doesn't matter), it was like someone pulled a moving blanket off the sound. During the hour or so of listening, we kept going back to the 824s and a set of 624s for reference. Each time it was an, "Ewww, those just sound like we're listening through a blanket," moment. I know some people that love them, but I'm not one of them. They had no sound field, a barely discernible stereo stage, weak highs and lows, and the mids weren't all that smooth. Nope, no Makies for us. Ultimately, the Yamaha won the day. On sale for $269 apiece, they were the cheapest ones on the rack. And both of us agreed that if they weren't the best sounding, they were in the top 2 or 3, and the other two in that short list were at least 2x if not 3x more pricey. So don't be fooled. Just because it comes with a big price tag doesn't mean it's always the best. And if the price is a good deal, it doesn't mean it's not. Judge with your ears before you judge with your wallet.